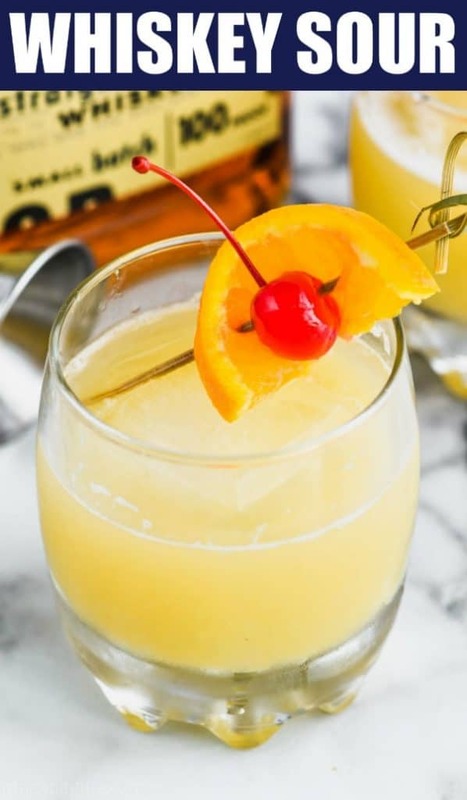 This Whiskey Sour Recipe is the ultimate classic whiskey cocktail recipe! It’s delicious, easy to put together, and needs to be a part of your life! Every now and again, you need an easy, comforting cocktail to end a busy day. 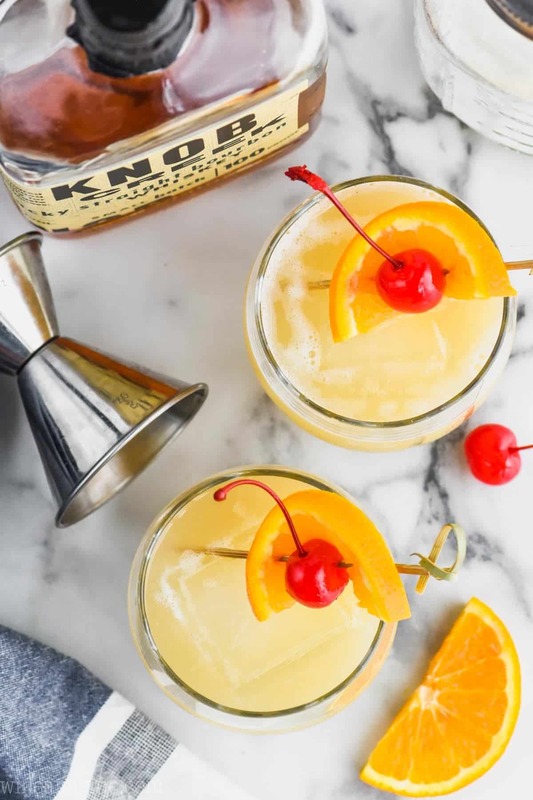 This Whiskey Sour Recipe is the perfect no frills, big flavor firewater that you can’t wait to come home to. Happy Friday, friends! I’m so excited about this cocktail. It’s perfect for a Friday night after a long week. 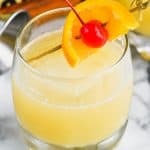 This is the best whiskey sour recipe! It combines a tangy bite of lemon with the sweetness of simple syrup and a frothy egg white mixture you’ll want to make again and again. Looking for more whiskey classics? Then you’ve got to try my Whiskey and Wine or this super easy Cranberry Apple Whiskey Cocktail. WHAT INGREDIENTS DO I NEED FOR A WHISKEY SOUR? Good quality whiskey. 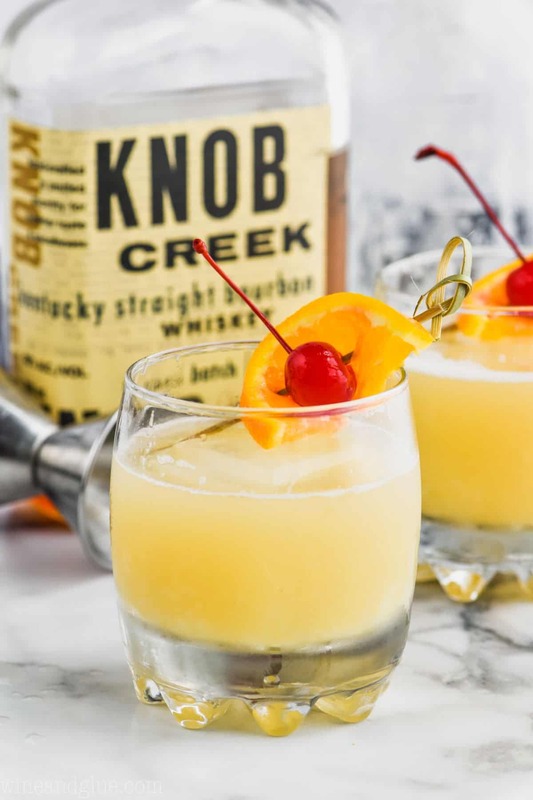 Knob Creek is the best whiskey for this whiskey sour recipe. Lemon juice. Fresh lemon gives off a gorgeous aroma and tastes much better than store bought sour mixes. Simple Syrup. 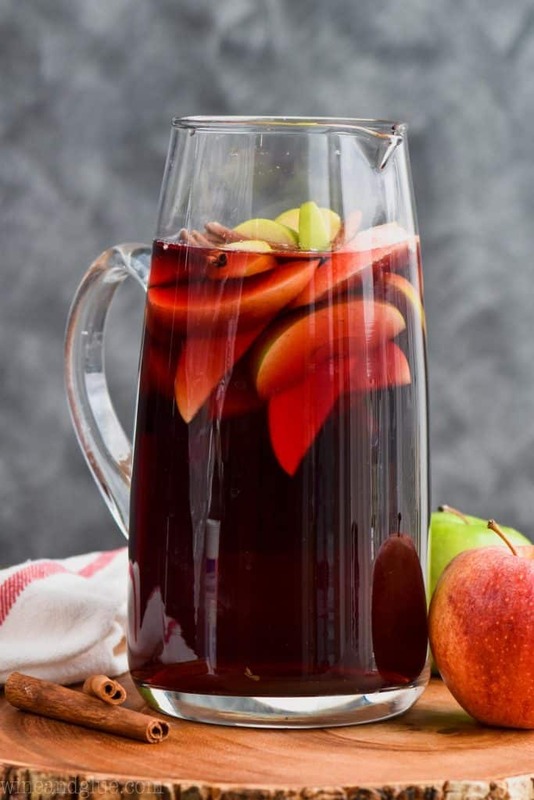 This is so easy to make and can be used in a million different recipes, like this Apple Pie Sangria. Egg whites. Now I know what you’re thinking: adding an egg white makes this a Boston Sour Recipe, right? Well, yeah sure. Technically. But that foamy texture is so delectable I always take my whiskey sours this way. Egg whites are also the secret ingredient to this delicious Gin Fizz cocktail. 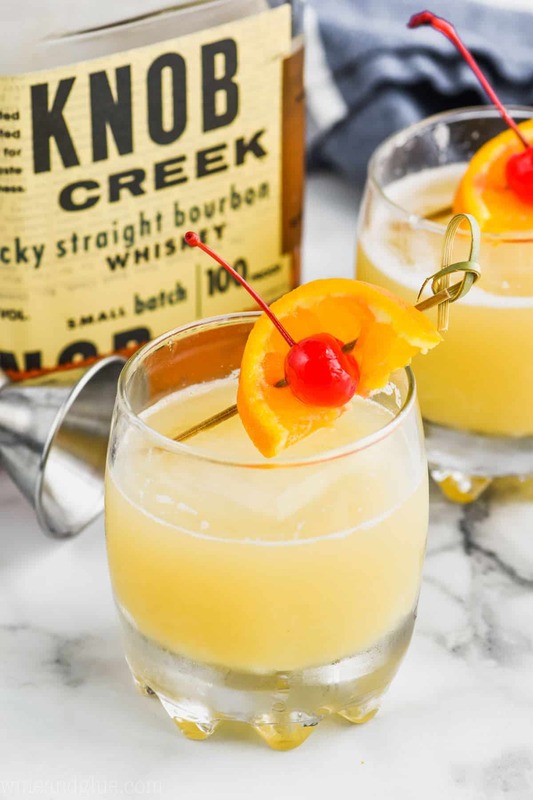 For two cocktails combine three ounces of whiskey, a couple ounces of lemon juice (the juice of about two lemons), just under a couple ounces of simple syrup and two egg whites. Put all the ingredients in a cocktail shaker and shake that baby up until it’s good and foamy. Strain the frothy mixture into two cocktail glasses with a big ice cube in each glass. Garnish with oranges or cherries or both and you’ve got yourself the most impressive looking and tasting cocktail. Happy hour can’t come soon enough! 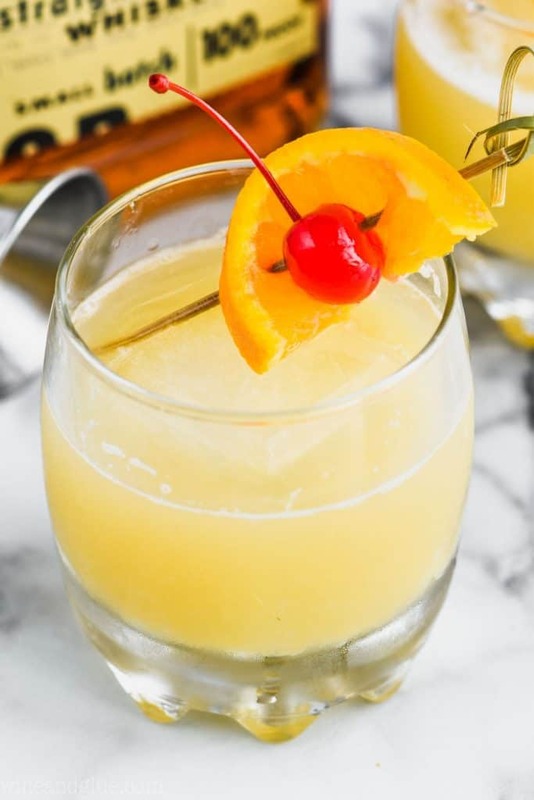 This Whiskey Sour Recipe is the ultimate classic whiskey cocktail recipe! It's delicious, easy to put together, and needs to be a part of your life! Combine the whiskey, lemon juice, simple syrup, and egg whites in a cocktail shaker. Shake until foamy. Strain into two cocktail classes over a large ice cube. Garnish with orange and cherries.